As with anything involving water, high speeds and heady thrills, safety is of primary concern, and the popular watersport of tubing is certainly no exception. Tubing is an exciting way to experience the thrill of high speed watersports without the need for special skills or training and as such is popular with all ages and types. 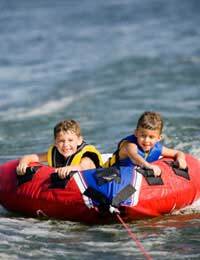 Tubing is where a large inner tube or rubber ring is tethered to a power watercraft and then one or more tube riders, or tubers, are towed at high speeds across large rivers, lakes or coastal waters. The first consideration for tubing should be whether the equipment being used is appropriate for the planned recreation and in accordance with its manufacturer’s guidelines and limitations. For example, the tube will have been designed and tested with a particular capacity of weight, size, number of riders and towing speed in mind. Whilst it is sensible for those on the watercraft to wear a personal floatation device, or PDF, it is absolutely essential for the tuber to wear one, whether they are able to swim or not. For instance it is quite common for tubers to be thrown off their tube into deep water and become temporarily separated from the motor craft. The tow line connecting the tube with the boat should be checked before heading out onto the water. It not only needs to be securely tied to both craft but also checked for any signs of fraying, cuts and general wear and tear. The line should also be specifically designed for towing inflatables. As the tower of the tube, the driver of the boat is not only responsible for how thrilling the tubing experience is but also the safety and welfare of the tuber too. Therefore it is important that the person at the helm is experienced and informed driver with a good knowledge of the safety, boat and water regulations. The driver should be alert and sober and drive responsibly, taking into account hazards on the water including other craft and riders. It is a sensible, standard practise to maintain a buffer zone of at least 50 metres from rocks, buoys, docks, shorelines and other boats. They should also consider the age, skill, strength and swimming ability of their tubers. For instance whilst high speeds, sharp turns and giant waves can enhance the experience for the older more fearless rider they can spoil it for the younger tuber. As a general rule speeds should be kept under 10 mph for those 12 or under, under 20 mph for younger teenagers and under 25 mph for adults. The boat should be slowed when crossing wakes as bouncing off wakes at high speeds can result in back injury for the tubers, particularly if they are riding stomach down. The boat should also travel at slower speeds if it is pulling more than one tube as dual tubing can result in result in serious collisions if the two tubers collide. As the boat driver is normally facing the opposite direction to their rider they are unable to keep an eye on them whilst maintaining boat safety. Therefore a spotter should be employed to sit in the craft with them, whose job it is to keep watch on the tuber and alert the driver when any mishaps occur. Before starting the boat engine it is important to make sure that the rider is ready, otherwise their tube excitement will be extremely short-lived. The tuber should have a steady grip on the tow line and be properly and comfortably positioned inside the tube. If there are multiple passengers on board they should be aware of how to balance their weight correctly together to stay safely on the tube.